Four members of the Undergraduate Residential Experience Committee field questions from students about the committee’s plans. The committee held its first town hall meeting Monday and discussed plans to implement residential neighborhoods on campus. Students raised concerns about how residential colleges would play into the University’s “neighborhood model” at the Undergraduate Residential Experience Committee’s first town hall meeting Monday night. 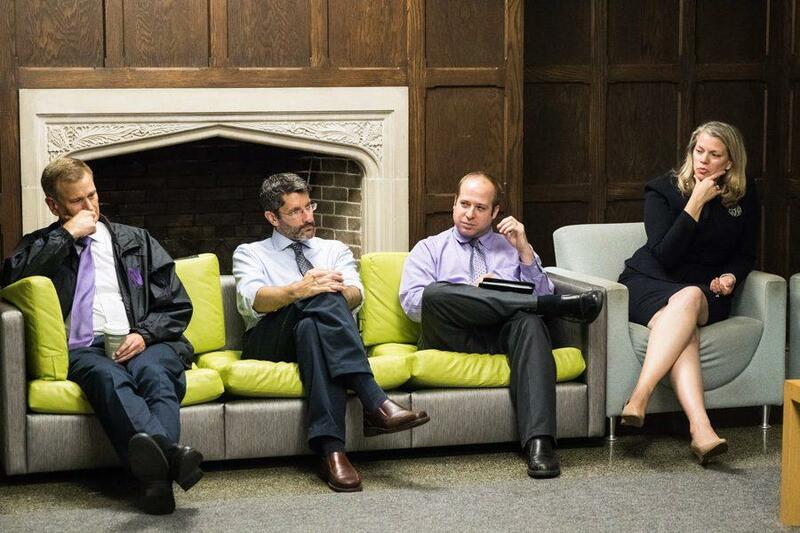 Roughly 13 students and five administrators attended the discussion held in Rogers House. The meeting began with an update from the committee about its goals and plans regarding on-campus housing. Currently, the committee has tentative plans to bring the concept of neighborhoods to residential living, said Tim DeBold, coordinator of Residential Academic Initiatives. This would involve creating communities among different residence halls and colleges where each building would offer specific amenities, he said. The prototype for this concept is the neighborhood comprising Allison Hall, 1838 Chicago and Shepard Hall. Allison offers a dining hall, 1838 Chicago offers a fitness center and Shepard offers an engagement center. Following DeBold’s presentation, facilitators opened up the floor to students. Several students in attendance, who are involved in residential colleges or serve on the residential college board, said they are worried a larger neighborhood could diminish the unique, tight-knit community of a residential college, some of which only have a few dozen students. “We pointed out some serious holes in the plans,” said Joey Salvo, a Weinberg junior and president of Slivka Residential College. Questions regarding Greek life involvement, themes and financial commitments were also raised at the town hall. The questions were often met with the reiteration that the committee has no set plans and is focusing on student feedback. “We don’t have detailed blueprints and programmatic schedules and (organizational) charts,” said Brad Zakarin, director of the Office of Residential Academic Initiatives and one of the four committee members hosting the event. The associate vice president and chief of staff of student affairs, Julie Payne-Kirchmeier, joined Ron Braeutigam, committee co-chair and associate provost for undergraduate education and Paul Hubinsky, interim director of residential life, in hosting the event. Monday’s meeting was the first of seven town halls scheduled for October. Various committee members will host six more meetings similar to Monday’s at different locations across campus. Zakarin said there will be a student moderator helping at each event and calling on students for questions at future town halls. Although it was only the first of seven, many students said Monday’s town hall was a good starting point for the conversation about on-campus housing.